Mozilla Firefox is a fast, full-featured Web browser. Firefox includes pop-up blocking, tab-browsing, integrated Google search, simplified privacy controls, a streamlined browser window that shows a number of additional features that work with you to help you get the most out of your time online. 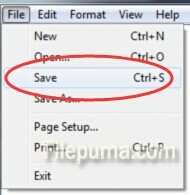 Here is the instruction to tell you how to remove misspelled words in Firefox. 1. Click “Start”. type “persdict.dat” into the blank, click “Enter” to search the file. After a while, you will find your persdict.dat file. 2. Open the file with Notepad program. 3. Now you need go through your list of words. Check every word carefully, select and delete the misspelled words. 5. Restart Firefox. The misspelled words should now have been removed. Tips: If you carelessly add a word to the dictionary, you could directly right click and click “Undo Add To Dictionary”. This is a quick easy remedy for us.